How to find a job in Canada you ask? A new and easier way is to use the new Job Bank iOS and Android app, launched by the Government of Canada. The bilingual Job Bank site helps Canadians make career decisions based on job market information provided by the federal government. Now, this Job Bank website has gone mobile, part of the government’s “goal to provide Canadians with digital services that work for them,” according to a press release. Now, with the Job Bank app, the most popular features of the Job Bank site—search and alerts—are available on mobile. Tens of thousands of jobs are listed and can be searched from, while Job Alerts can be created to be notified when opportunities are available. “We have come a long way since the days of paper job postings pinned to boards, and we are taking it one step further with the Job Bank app. It’s the next step in our efforts to deliver high-quality digital services to Canadians, because looking for work should be straightforward,” said Patty Hajdu, Minister of Employment, Workforce Development and Labour. 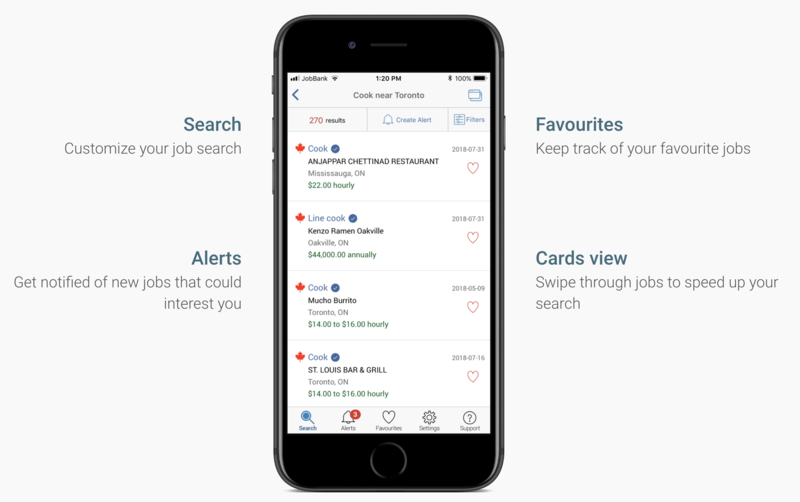 The Job Bank app quietly hit the App Store in February of this year, and since then it has been downloaded over 50,000 times, while 438,000 job searches have already taken place. a new platform to promote employers’ jobs to thousands of potential employees. Click here to download Job Bank for iOS in the App Store.